The 2017-18 Winter League Campaign consisted of 138 betting days spanning 10 and-a-half months. Despite a rocky start and other challenging periods throughout 2017-18, a starting bank of 4,000 units was eventually turned into 38,925. Regarding the selection of systems we will expand a little on our decision-making process in the league-by-league review below. For compiling this portfolio we used our HDAFU Tables. To read about the compilation of the portfolio used for this article here’s a link to our analytical article: Judging the Risk of a Football Betting Portfolio. There you will find explanations on how to calculate the overall probability/expected hit rate of a portfolio and how to judge the risk. You will also learn how to predict winning and losing streaks, and what kind of profit/loss curve to expect when compiling your own portfolio of bets. Let’s now dive in to the performance report without further ado. We start with a league-by-league review and then see how they all put together reduced the risk and finally produced a result as expected. In Image 2 below you can see that hardly any individual system (league) within the portfolio met its expectations (predictions), yet the overall performance of the portfolio fully met the expectations, profit-wise, yield-wise and hit rate-wise. Despite its low hit rate this system was included because a healthy yield was expected. When judging a system fit for inclusion, healthy yield indicates that a profit can still be made even if something goes wrong, e.g. the hit rate is a little lower than expected. The hit rate was more or less achieved, but the profit was 65% below budget. Perhaps the odds that were obtained were too low or there were just not enough larger priced winners in this cluster. Included because of the high hit rate indication to add reliability and stability to the portfolio, despite a low yield expectation. The hit rate was below expectation and hence the yield too. However, a profit is a profit albeit small here, but no complaints. In the end, Belgium produced a profit and helped the portfolio to remain balanced over the season. Another judgement call asking the anticipated yield of around 20% to buffer the expected hit rate and still turn a profit. The hit rate was below expectation and hence the yield too. But still a profit from a medium risk venture. Despite its low hit rate this system was included because a healthy yield was expected. It was felt that the risk was worth the potential reward. The EPL is probably the most analysed league in the world and it is difficult to spot long-term value for betting systems that are reliable and come out to expectations. The hit rate was in line with expectations but the yield was not. Nevertheless, a healthy profit was achieved. The yield looked slightly too high for an expected hit rate of 50%. This may have been an arbitrary positive result observed in the inflection point graphs, especially as the expected number of bets was only 36. Nevertheless, this system was included in the portfolio because of the risk-reward balance. Only 30 bets were played (from expected 36) and both hit rate and yield were much lower than expected. Normally, systems with an expected hit rate of under 35% (classified as ‘high’ risk) and with an expected yield between 15% and 30% (‘medium’ risk) get an overall risk judgement: HIGH RISK. Although the combined expectations of hit rate and yield here would have labelled this system as ‘high risk’ we downgraded the overall risk judgement to ‘medium risk’ as it was Germany and the Bundesliga is probably the statistically most reliable league we are aware of. German underdogs (not sausage dogs) were a (woman’s) best friend, and proved to be the most successful of all our systems. If the EPL is just about the most ‘statistically unreliable’ league, then the Bundesliga is at the other end of the scale. There is something typically German about the Bundesliga’s constant conformity to statistics, season in, season out – very correct and very efficient. The Greek system was chosen for risk diversification in our portfolio. Despite associated lower yields, bets with a high probability of winning break up losing streaks in the portfolio and add stability. Not a huge profit but a profit nonetheless. Low priced home wins are naturally odds-on favourites also. Better prices can be achieved on these by placing bets further back in time before the event. Like Greece, this one was chosen for risk diversification combining a relatively low yield with a probability over 50%. Italy was our second best performer with its mixture of odds-on and odds-against away teams. However, almost all of these were the favourites and just a 15% swing in hit rate (not unnatural with favourites), was enough to double the yield harvest. The yield here stuck out as being too high for a system with such a high probability. This may have therefore been an arbitrary positive result observed in the inflection point graphs, especially as the expected number of bets was as few as 15. Nevertheless, this system was included in the portfolio and judged as medium risk. A very tiny system with only 15 bets expected and indeed, 15 bets played in the end. However, not 12 wins as ‘expected’ but only 11. With margins so tight it was no wonder that the yield figure dropped. Otherwise, despite initial indecision whether to include this system, a profit was made. With such low probability on the table, unreliability was expected, but the reward (yield) was worth pursuing. Furthermore, only 40 bets were expected. This system therefore had all the hallmarks of ‘high risk’. Betting on underdogs is notoriously volatile and it was lucky that the very last two bets of the season both won to avoid a deficit here. 40 bets were expected, but only 37 played that fitted the selection criteria. 10 wins were expected but only 8 materialised. This was the only system in the portfolio with such a low hit rate expectation in connection with very few bets expected. It was always going to be a shaky, unreliable ride, and it didin’t disappoint. Was there a single system within the portfolio that performed as expected? There was not a single system that performed as expected within the portfolio. Of the 10 chosen systems illustrated here, eight underperformed, and only Italy and Germany overperformed (both ‘medium’ risk systems). Although some of the other eight systems succeeded to surpass their expected hit rates, the profit at the end was less than expected. This indicates that perhaps the odds played across the board were a little below those used in the HDAFU simulation tables. After you have compiled your portfolio with due care you need to trust your own judgements and follow through fully with your betting endeavour as planned! The information contained in the spreadsheet is invaluable and we are sure that you will feel the nominal £5.00 GBP charge is a real bargain: It is an ideal template for your own portfolio structuring and monitoring processes, and in addition it provides the opening and closing odds for the 518 bets included in the portfolio. The spreadsheet details every bet in every system used. Includes tabs for the overview of the portfolio, match data of the 10 systems used, as well as their opening and closing odds, and finally the odds used and the staking plan. The most important feature is the Ratchet staking tab, which will provide you with the ideas and tools to manage your betting bank professionally. You might say that the portfolio underachieved. But this is betting! The only goal is to finish with a profit! Any achieved profit may be below expectations or above, but as long as there is a profit, the portfolio must be considered as having been successful! Therefore, remember to look at the performance of the whole portfolio for judging if it was successful. Do not concentrate on the performance of individual systems; not even after the season has finished. Potentially fatal if your mindset is affected by worries about individual systems, especially whilst your campaign is in-play. However, there are exceptions to this rule and I will write about this in another article and explain when a system can be abandoned in-play, or when a new system can (or should) be added during the season. You certainly noticed that in the above chapter we wrote that the portfolio achieved a profit of 9,909 but stated in the title of this article “35k in 138 Days”. To predict the most likely performance of a portfolio you only can simulate a profit/loss using flat stakes. The same applies to judging the performance of a portfolio. You can only use flat stakes to appraise the effectiveness of a portfolio. It doesn’t matter what staking plan has been used; in order to evaluate (and compare with predictions) the performance of a portfolio, you will need to see what would have happened when using flat stakes. Otherwise you will be comparing apples with pears. The sequence of winning and losing bets is pretty random and any staking plan applied would therefore skew the review process. Therefore remember always to use flat stakes for retrospective analysis. However, the portfolio used to illustrate this article produced a final profit of 34,925 units using ratcheting (= gradual increase of stakes when winning). More details you’ll find in the article: Winter Leagues 2017-18: Bank Management, Staking and Timing >> This article will be published within the next few days. The rationale behind this technique contends that a portfolio constructed of different kinds of bets will, on average, pose a lower risk than any individual bet (system) found within the portfolio. Have another look at Image 2 for the losing streak sequences. The expected individual longest losing streaks within the leagues (systems) were as long as 11 bets in a row. Denmark produced an even longer losing streak than expected. It started on the 26/8/2017 and continued until 29/10/17 – more than 9 rounds of games! Nevertheless, they recovered to finish with a positive return, although far lower than expected. However, the portfolio as a whole only experienced a losing streak of seven bets in a row (chronologically). But try and look at the portfolio as a whole and consider one round (week) as one ‘single bet’. This perspective reveals a longest streak of four (out of 47 rounds) – just about bearable! Please remember that in order to judge the success of any betting portfolio it is necessary to evaluate the performance of all of its systems together as one, not just individual group members (i.e. bets in just one league or system). I hope you enjoyed this article and learned how to judge the performance of a portfolio. However, if you are still not clear, then please feel free to ask any questions via the comment section below. Hi Soccerwidow, I read all the bad experiences of some users and I’m asking myself if I have to stop betting now.. I started on the 1st December and more or less I have the same bank of when I started.. What do you advise me to do? reduce your stakes to a size that you are comfortable when losing. The problem is that portfolio betting is a real art form and if portfolios are not constructed soundly, then there is a high risk that they don’t win. It’s the same with every portfolio, such as shares, etc., not only betting. Therefore my advice is that until you have compiled a sound portfolio to reduce your stake sizes considerably (to ‘pocket money’ sizes) or even play your portfolio on paper only. Thanks for your answer Soccerwidow. Well, I think my portfolio is mathematically sound since I made it following your instructions step by step. In fact after 5 or 6 rounds of betting I have now a little more than my initial bank and it looks like it’s going as you described in your articles: the expected hit rate is being respected, the longest losing streaks as well and of course also the ups and downs…. but only 1 month has passed since I started so it’s too soon to see a long term profit. So my question is: can a mathematically sound portfolio fail in the long run? If yes, has it ever happened to you? if it’s your first season in HDAFU betting, you should listen to Soccerwidow’s advice. I had my first HDAFU season successful and I think you already know what happened next. Success made me absolutely sure I know how to use the tables to make money, but… in fact, I didn’t. So, take Soccerwidow’s advice and keep doing it for at least 1 season for both summer and winter leagues. You will be better protected from big losses, I think you are far less likely to be lucky and win 2 seasons in a row compared to just one when not knowing what you are really doing. I was carried away by my 1st (summer) season success and I payed a big price for it. And better run your tests on paper only. I’m not sure yet since Soccerwidow didn’t send me an email about her findings about my 2018 summer portfolio yet. And there should be an article about our 3 portfolios as she said. But you probably noticed that Right Winger and Soccerwidow judge the risk of a system differently, what is low risk for Right Winger, may be a high risk system for Soccerwidow. My 2017 summer, 2017-18 winter and 2018 summer were based on Right Winger’s risk perception. I will run 2018-19 winter simulations once I’m in the mood to do it and understood my mistakes from her report based on Soccerwidow’s risk perception to see if it will work then. Based on my current experience, there are some things I would suggest not to do. If system has a losing streak of 8 bets in a row recurring 2, 3 times, they can easily add up into one long losing streak, especially if a system is high risk. I had a system with a losing streak of 8 bets, recurring 3 times in analysis, that turned into 19 lost bets in a row. Stay away from systems that have 20-25 bets a season\half season and longest historical losing streak close to that number. Or even worse, exceeding it. You risk losing every single bet. Over those 3 seasons, I had zero odds lower than odds range in about 80% of my systems. Regarding systems with zero odds higher than first inflection point, some of them still won, some lost. But the majority of them were high-risk systems according to Soccerwidow’s risk perception. Maybe that led me to long-term failures, but I have to run my 2018-19 winter simulations first to make any conclusions. Since it’s your first time and you do it with real money, I consider your endeavour as high risk. If you still decide to continue with real money, my suggestion is no more than with 20 units. Don’t hurry. Based on that quote how come your 2017-18 campaign report shows that you were betting on odds that were below zero odds, actually around 20% of total bets were placed like that. That makes me unsure if its fine to bet every game in chosen system and just try to be close to average odds at the end or if we should skip some bets but then the result of the system might be different than HDAFU tables suggest. Also your 2017-18 campaign results would be different if all those bets would be skipped. The campaign report you can download provides you with every single match that qualified the criteria set in the portfolio (including the matches below Zero odds) in order that you can carry out your own calculations saving you from the job to go through thousands of games to find data. How come you only found 29 matches that were below zero odds? If I compare “zero odds” versus “odds available when placing bets” under system performance tab – Italy: Away Win Whole Season already had more then 60 bets where available odds were under zero odds. Second question is if we look at the results that we get from HDAFU tables, they include all the bets from last 5 seasons (bets below zero odds included) , so if we use a system but we then only bet above zero odds of that system, would we have to actually make a second calculation to see what the results would be then in those 5 seasons betting only >zero odds bets. To your second question… It depends which HO/AO quotients/odds clusters you look at. The example you chose was Italy – betting on the favourites to win; these are high probabilities, therefore below Zero odds can be played. The example I looked at was the EPL – betting on the draw – low probabilities, zero odds far below the average odds. Most of the systems in any HDAFU portfolio are going to be low probability clusters. Therefore, the rule of thumb is, not to play below zero odds. By the way, a ‘rule of thumb’ is a broadly accurate guide or principle. It is a method of judging that is not exact but is based on experience. A ‘rule of thumb’ is not set in stone! Can you clarify what is “expected odds” and “observed odds”? Because I’m not sure. the ‘expected odds’ are the average odds that are shown in the ‘System Picker’ tab (and you can certainly add the ‘Zero odds’ that are also shown there). The ‘observed odds’ is the harmonic mean of the actual bets you have placed this year. Rado and Simon have already sent me their monitoring spreadsheets and they even included all bets played so far this season. This information I don’t really need but it may be helpful if I find something on their summary tabs that doesn’t make sense. I have only started to look at it but for example, the EPL is showing so far this season a somewhat screwed distribution. For example, the normal draw distribution in the EPL is 24% but so far this year only 21% of the matches finished with a draw. This is quite a strong deviation and has, of course, a negative effect on ‘backing the draw’ if it is part of the portfolio. I’m going to look at it in more detail later this week and reply to each individually. It is also very likely that I write an article with my findings, of course, without giving away any names or systems. ok, thanks for your help, I will send you my 2018 summer campaign once I prepare everything, since I did not even start simulations with my 18/19 winter tables. Hi Jo, I’m sorry but I haven’t started to look at your portfolio yet. Currently, I’m analysing Simon’s portfolio and what I can already say is that Simon has been placing far too many bets below the Average odds and even Zero odds. This leads ultimately to a long time loss! The absolute main rule in betting is that you must never play any bets below the Zero odds (only very rarely odds below Zero odds may contain value but never when playing a system). You find these odds displayed in the ‘System Picker’ tab. In the EPL you played 57 bets and experienced a low hit rate of 24.6%; if you would have only played the bets that were at least the average odds (3.42) you would have reduced the number of played bets to 23 but increased the hit rate to 34.8%. Instead of occurring a loss of -9 stake units you would be up in profit 5 stake units. I strongly recommend the two of you, Jo and Simon, to stop placing any bets immediately until I’ve had the time to look at your portfolios and monitoring spreadsheets. I’m really sorry about your losses so far but please better stop now before any more losses occur. That it went all well until mid-October is because there were for some reason fewer bets under Zero odds; the odds turned at this point with more than half of the bets being below Average (and even Zero) odds. Why I don’t know yet but I will think about it and see if I can come up with an explanation. Another thing what jumps out is, that the clusters are sometimes a little bit too big or too small. Yes, I have seen the comment. Thanks for looking over my portfolio. The point you have raised about the odds I have been placing bets at comes a huge surprise to me. I will have to check this issue myself because I know am I diligent with the bet placement process and always make sure I take odds that are above “zero” odds. Any odds below this, or that are not commensurate with the HO/AO being used, I scrutinize. If something is off, I don’t bet it. I wanted to put these thoughts down before I forget, and then put the betting issue out of my mind over Xmas. Taking the EPL system you picked out. My “zero” odds for the HO/OA quotient used was 2.58. So any odds over 2.58 would be as having value. The average odds used as a guide to what to expect for the system was 3.43. I then checked my worksheet and see my harmonic mean odds over 57 bets placed is 3.34. So I’m placing bets well above the zero odds in every single bet. In regards to average odds historically for the entire system, some of my odds obtained are lower, some are much higher. I then compared this to the system in the EPL you published in the 2017-18 campaign. Your zero odds were 2.52 and your harmonic mean of odds obtained was 3.32. What were the average historic odds for the EPL draw system you used? So in comparison, with both mine and your system, the figures are almost the same. It doesn’t make sense that I can be placing bets way above the zero odds and not have value, and therefore that be the reason why I am losing. If we must bet above the average odds irrespective of the zero odds, otherwise we lose long term, then that is a new concept to me, and certainly something that was not specified as a “new” requirement with the new HO/AO quotient approach. It just doesn’t make sense at all. In the meantime, I will wait for your report, which I’m grateful for, and I will conduct my own investigation to establish the exact relationship between the zero odds of my systems and the odds I actually obtained. please don’t discuss your portfolio in detail on the website. Soccerwidow is for many readers and not for a personal discussion between two people. Therefore, although that is something I normally never do, please let’s change to communication per email. very nice reads here and great that you all started to commend. Since we already mentioned the footballdata website, I think, its worth to read the betting articles provided by this site. I personally dont wanna advertise the site here, but I think the articles make very good points which are easy to get and they use common statistical measures and language to provide evidence. In my opinion, you will also find reasoning in the articles why your protfolios did not perform as you have expected them to perfom. However, maybe I am wrong. Since you already have purchased the tables here it would be nice to keep us updated about the future performance even if its just on paper. With each passing week, I am starting to believe more and more that the HDAFU tables are of no use for REAL WORLD betting. Yes, they provide romantic “dream scenarios” on what might happen, but the real world bookmaker margins are a completely different thing. Why I am saying this? Because today, I completed my NINTH week without a considerable positive balance (with 8 of the 9 weeks being losing, and only 1 with a minimal profit). And the weeks are not simply losing, they are losing HEAVILY. Two of the weekends were catastrophic – about 20 STAKES loss each. This must be impossible if the HDAFU tables are functioning properly. Each week of the last 2 months has been the same – loss, loss, loss, loss, loss, a low odd winning bet, loss, loss, loss, loss and so on into infinity. With today being the 20th out of about 48 betting rounds and me standing at a 35 stake loss of REAL MONEY, I don’t see when the portfolio will have time to recuperate the losses and return a profit. Up until week 10, everything was running perfectly. Almost too good to be true – the hitrate was within a percent of the projected, every week was bringing about the same profit on schedule, I had almost no losing weeks, 10-11 out of my 14 full season systems were in profit. Then, all of a sudden, about the middle of October, the nightmare came. In only 2 weeks, I lost all of the accumulated profit. From then up until now, I have been racking enormous losses and throwing away my hard-earned cash. However, I don’t understand how this is possible. I mean, just like I said before – even if the tables were worthless and did nothing, how can the hitrate in 5 or 6 of the systems be about half of the projected, and that after 50 or more bets! When I bet on odds around 4 in the Netherlands draws, I expected about every 4th bet to be winning. However, only about one in ten draws materializes?? The same story in England – the draws there simply aren’t happening! Loss, loss, loss, loss, loss and so on. Spain and Denmark were running amazingly, and now both are at 10+ running losing streaks. However, I have long decided to stick faithfully till the end of the season and analyze the final results and hitrates. If this venture fails again, I will never again use this type of tables. Rado, my experience closely mirrors yours. 10 good weeks to start with where all systems were doing well, and then it all came crashing down. The last 7 weeks have been consecutive losers with 52 stakes lost in that time. The entire campaign shows a 14 stake loss at present. The hit rate I’m seeing in this span is 34%, a full 14% lower than the forecast. As I’m running a campaign with a blend of whole season systems and 1st/2nd half systems, with the composition ratio weighted to the split season systems, there is 5 rounds maximum to recoup losses. If the majority of 1st half season systems fail, which is looking increasingly likely, then it closes the door on any potential recovery and cements the losses. I would really like to hear these stories, because firstly it would show that the tables can be successful, and secondly it would highlight to me where I may be going wrong. But that feedback is nowhere to be seen, so I can only go on the evidence I have. In my mind, it’s obvious that people will have different portfolios, because some will choose whole season systems exclusively. Some will blend whole and split season systems. Some people will buy different tables to other users, so the make up of each portfolio is going to be different. But it has to be acknowledged that most people will buy England, Germany, Spain, Italy, France e.t.c because they are the most popular leagues. Then when you look at a table for one of these leagues, you always see a single system that is head and shoulders above everything else in that league in terms of profit and consistency. Using HO/AO quotient (without specifying the range) you see in England, the 1st half draw system is without doubt the best. In Germany, the whole season Home win is excellent. In Italy and Spain, Away wins are excellent. It’s undeniable, in most cases the majority of us will gravitate to these lucrative systems that are highly profitable and consistent from year to year. And no matter what peripheral tables are purchased, I’m convinced the same applies. So, I firmly believe that systems like these will form the core of most people’s portfolios. However, these systems, that are historically lucrative and consistent are on the whole doing terribly this year, and time is very short for any sort of correction. So, with that said, perhaps that’s why the profitable portfolio stories are not flowing in. Of course, as you know, I don’t subscribe to the notion that multiple systems with excellent historic stats are all failing at the same time due to poor luck. So, I have really gone back to the basics of this endeavour. It stands to reason to that what we put in to this endeavour is what we get out of it. That’s a pretty solid principle to work by. Some alarming facts are obvious about the new incarnation of the HDAFU tables and I wonder how much this plays into the bad results being experienced. In the 2017/18 version of the tables we were told by RW that the data set being used was manually scraped from ODDSPORTAL and that the odds therein were checked manually to ensure that anomalous odds or blatantly incorrect odds were removed from the data set or corrected. That fact alone would give confidence that the data set being used as the basis of any analysis has its integrity verified and therefore can be relied upon. Following that, since we knew Oddsportal was where the odds in the HDAFU tables were derived, it stood to reason to exclusively use Oddsportal for the purposes of checking the odds for the matches that would feature in our campaigns. We therefore know that all the match odds in our analysis came from Oddsportal, comprising more or less the same bookmakers over the 5-year period, and we would look to that set of bookmakers for the odds for upcoming matches. What we were therefore doing is using the same conditions for bet placement as existed in the analysis. That’s sound scientific method. Now we find, and this was not disclosed (at least nowhere I could see on the website) prior to purchasing the tables, that a huge unreliability has been introduced into not only the tables, but the bet placement process itself. The odds data is now sourced from a website called football data. I believe the reason for doing this, was as RW pointed out, that it was incredibly time consuming to go down the Oddsportal route again. I understand that decision. But to me, that means unavoidably that time saved in the production of the tables means that control of the data and therefore its accuracy has been sacrificed. No one can give a quality assurance – to the degree that was present with Oddsportal data – that odds data from football data is not riddled with errors. I recall RW telling us last year he found odds data that had favourites recorded as underdogs in some cases, in play odds in the ante-post final odds and so – on. The truth is, we have no idea what the person at football data does to gather data, if the time they state they gather the data is the actual time, and what quality checks they put it through. So, the reality is that we have purchased HDAFU tables that have not had the data checked, as it was in the previous year. To me, as a customer, that’s a step down in quality in terms of the product being sold. The data is THE most important aspect, the cornerstone of the product. That’s not the only issue I have with the data derived from football data. They have leagues with odds recorded on Friday and Tuesday, and then leagues that have odds recorded at kick off. The leagues that have odds recorded on Friday and Tuesday get the data from a website called Betbrain. The leagues that have odds recorded at kick off get the data from Oddsportal. That info is clearly stated on football data’s website. So right away we see another unreliability introduced into the process. If we are trying to recreate the conditions during bet placement that existed when the data was taken initially, then we would place our bets at a time close to the point of data capture. Now, I get that on Friday, the bets can be placed, no problem. But to be truly reliable that can only be done for leagues that had their odds recorded at that time. We know full well that odds move closer to kick off, so to place a bet on Friday for a league like Austria, Poland, Switzerland, Denmark, that has a game Saturday/Sunday, is not reasonable. We know odds move, sometimes considerably, in the hour before kick-off, and even before that, so to place the bets Friday, you run the risk of a game dropping out of your HO/AO quotient, or entering it. The point is, that the conditions present in the analysis are not being replicated and that will definitely impact reliability of results. I have monitored this over various leagues and it occurs often enough to become a problem if steps are taken to not mitigate this. Not only that, I’m wondering what the impact on our results will be of checking the HO/AO quotient on Oddsportal, when we know the odds data in the analysis came from Betbrain. I have looked at each website and clearly there is a big difference in the composition of their panel of bookmakers. Multiple bookmakers are on Betbrain are not on Oddsportal and vice versa. I signed up to Betbrain and they have around 60+ bookmakers on the panel. If you look at the data files you can download from football data, you will see that the highest odds are derived from around 40 different bookmakers. So which bookmakers do they include odds for in the downloadable files? We just don’t know. It could be any 40 from the 60 on the panel. Last year the instruction was to set up Oddsportal – there was an article about it – to include the same bookmakers that the odds data set was made up of. This time, that certainty has been removed, and even if assuming we use Betbrain exclusively, we are effectively choosing odds blindly when trying to determine if a match is in the HO/AO quotient – because we don’t know what bookmakers they take the odds from. If we use Oddsportal and not Betbrain, then who knows if the matches we are choosing are true to the data in the analysis due to the variation in books on the panel. The more I think about the above points, the more it seems to me that the reliability of the bet placement process has been hugely decreased due to not only the quality of the data but the inherent inability for us to place our bets within the parameters of the gathered data. It’s just not sound in terms of scientific method. The consequences of this could of course be disastrous on our bottom lines. I would be interested on the view of Soccerwidow/RW on this topic. In terms of balanced feedback, which is only fair; I said before, that the functionality and ease of use of the latest version of HDAFU tables was a massive improvement that I was very happy with, and most definitely made the portfolio composition process quicker and more accurate. But I stand firm that the tables are only as useful as the data that drives them, and this year that aspect seems hugely lacking. I hate to have to provide feedback like this, but honestly I think the HDAFU concept is very promising, and would like to succeed personally with it, but this year they just inspire no confidence for use in the real world. Thanks again for taking the time and trouble to comment. Just a quick response about the odds used. The 2018 Summer League tables were the last set produced using audited Oddsportal odds. Not only was it time-consuming to the point of madness, but it also turned out to be pretty pointless too. We ran simulations using Oddsportal audited odds and football-data odds captured a day or so before kick-off. And the end result is that it doesn’t really make any difference – you’ll see the same results regardless. If you can envisage how odds move throughout the ante-post market then it makes sense to say this. Think of a seesaw, with the draw being the pivot in the middle and the home and away wins being at either end of the seesaw. As demand for a bet increases, the odds for it will fall, but to maintain the financial equation of a balanced book, the odds at the other end of the scale must rise proportionately. However, the mathematical relationship between those two sets of odds remains relatively the same, despite the odds fluctuations. Therefore, using the HO/AO quotient as the basis for your systems means that it no longer matters when you check the market against your systems. The HO/AO quotient is there to help everyone focus on the relationship between the home and away (or favourite and underdog) odds. Auditing Oddsportal odds to the final minute or so before kick-off meant that for a true reflection of the analysed systems to be achieved, bets would have to be checked right at the death and placed just before the start of each event. The HO/AO quotient does away with that huge restriction. It recognises the symbiosis of the home and away odds and gives the freedom to check matches against your analysed systems at any time during the ante-post market. The HO/AO quotient ranges are wide enough to retain qualifying bets, even if their odds seem to be going up and down constantly. The reliability of the bet selection process (if using HO/AO quotient selection criteria) has therefore been markedly improved in my opinion, and definitely not eroded. Football-data odds are taken from their API’s and show correct odds at the time they were taken. Oddsportal is a different beast entirely, full of errors, mistakes, and misleading information to promote their affiliate partners and encourage sign-ups to them. Personally speaking, I don’t believe there should be any difference in results using Football-data odds (our simulations suggest the same reliability) and I also believe we have maintained integrity throughout the six years we have been selling the tables. The odds we use have always been publicly announced and are always carefully checked. I am going to publish an article in the next day or so about the validation of the HDAFU tables, so if you wouldn’t mind being patient a little longer (thanks to all of you for this), then I will hope to explain in more detail the structure of the tables and the ideas that go into them (including why they can’t be faked). I will also attempt to explain my gut feelings as to why the recent past has been such a rocky road for most of us – and I believe it has little to do with the tables and more to do with the sport itself. Okay, please watch the home page for that article and thanks to you all for your progress reports and diagnoses, the time some of your comments (Rado, Simon) must have taken to write is fully appreciated and highly respected. RW, thanks for taking the time to reply and address our concerns. I understand that as a business you put a lot of effort into delivering good quality products, and it stands to reason that you would then defend that work and the result of it when it comes under criticism. I don’t criticise for the sake of it though, or because things are not personally working out. I genuinely believe that the concept of the HDAFU tables is very promising, and really would like to get to the bottom of why for many users, the potential is not being fulfilled. It’s a method of betting that suits the time I have available to spend on it and would like to get it to provide some reward for what I invest in it. As far as I recall, in discussions that many of us had here on the blog last season about Oddsportal, the issue of timestamps came up a lot, as did the term “API”. So as far as I understand it, the odds data in the 2017-18 HDAFU tables was obtained from Oddsportal and based entirely on timestamps/API. So, in that regard, your process for obtaining the raw odds data would have been very similar if not the same as that which Football-data employed. The comment I’m addressing seems to suggest that Football-Data has superior data quality to that which would have come from Oddsportal purely because of timestamps/API’s, but we know that Oddsportal displays detailed timestamps for odds movement of every game. So, I don’t see any quality difference present through the act of scraping the odds alone. Just for clarity too, Football-Data specifically state they get their data from Betbrain for their main leagues and Oddsportal for the extra leagues. To me then, if 2 separate parties (Soccerwidow and Football-data) take odds data from third party odds data websites, which all appear to have time stamped odds, then they would be obtaining the same bulk data. The recognisable difference though is that you chose to audit the odds data for 2017-18, but Football-data, we do not know if they do this or ever did, so a question mark hangs over the quality of the data they offer. Can you in all honesty say to us that (bearing in mind it is our free choice to bet on sports) it is wise to bet on systems that we are deriving from data that is error ridden? Of course, it’s not your responsibility to tell us what we should do. It is up to us to assess the situation and decide the best course of action based on the information and evidence at hand. My point is, however, to ask if you really believe it’s wise to bet money when you openly acknowledge, and it is clear through the process, that the data being used is bad. You say that “Personally speaking, I don’t believe there should be any difference in results using Football-data odds….” You then mention there are simulations that corroborate this. It seems far too convenient though to just dismiss the issue over the quality of data and say it makes no difference. I have a hard time believing that results are identical using audited odds and error ridden odds. But without seeing or running the simulations myself, I can’t verify that to be the case or be reassured and confident in it. The take home thing for me is that the principle of betting based on bad information just really sticks out here as a big red flag. Maybe if I have time in the coming weeks I will check a set of audited odds against a set of Football-Data odds and see what is what, then report back here. The fact that the HDAFU tables are way above my excel skill level will likely preclude me from doing that though. Would you be at liberty to reassure us as customers and perhaps publish the results of the simulations that confirm that audited odds vs unaudited odds (with errors) makes no difference to the quality of the results? my suggestion is do not bet real money anymore. If you stick faithfully to the end, it’s more likely you will lose even more, than win back. I had 2 summer and 1 winter seasons completed in HDAFU betting. Only the first one, 2017 summer went well and it was struggling for the first 7 weeks only, after that it was going up with brief failures that did not affect my trust for the system at all and I ended up with +7600 units based on 100 unit stakes. However, it was my 1st season doing this with real money, so the real stakes were much lower for testing reasons. Since it was a success, I found no reason not to increase stakes significantly for 17/18 winter. And 2017-2018 winter went well at the start, later we all now what happened. After the season ended I remember reporting myself that I finished up with -2700 units due some mistakes instead of making +2000 units profit. I gladly accepted this huge difference since it restored my belief in the system. However, when I simulated everything with flat stakes, I discovered a mistake, there was a bet I skipped at kick off and placed later in-play bet on much higher odds and by mistake marked it as a winner that skewed the results a lot. Based on flat stakes, no skipped bets, no other mistakes, there was a loss of 4261 units. 2018 summer result based on flat stakes is -7889 units. I’m glad I didn’t go this far, after poor portfolio failure at the start I decided not to stick to it to the end conversely of what I did with 17/18 winter season. But I kept simulations running to the end and this is a valid warning for all of you willing to keep failing portfolios run to the end. Also, there was an article regarding inflection points adjustment for 2018 summer season, that would lower the first inflection point and increase the second inflection point. If Inflection points were 6.00-8.00 after filtering, after adjustment they were let’s say 5.7-8.4. I can tell from my rough calculations this experiment was detrimental for the results. Maybe that’s why there was nothing about it for 18/19 winter season. In 2018 summer even low risk systems failed miserably: 1.67-2.77 odds range, all seasons in 4 digits profit, hit rate 52.56%, yield 14.46%, 125 bets on average per season produced -2547 units loss. After complete failure with 17/18 winter and failing even more miserably with 2018 summer portfolio I decided not to try my luck this winter although I bought the tables. I will not change my mind, your results with it tells me enough. It seems my success in 2017 summer was in fact my road to disaster. System looks to be sound here, however it seems to have so many variables and randoms that we better don’t stick our fingers between the door anymore. As Right Winger once said, there are far better ways to make money, we failed here, let’s do it somewhere else, not so risky as gambling. Of course, it’s your money, your decision, but 2 failed seasons in a row and failing 3rd one in a row is the best reason to STOP BETTING NOW! Or you will mark my words in the end of the season! I know it’s hard to retire with loses, but I will better accept them than risk of losing even more with so many warnings sticking out like a sore thumb. If you have any questions, I will gladly answer them. Nice to hear from and glad you are well. We discussed our experiences a lot last season and share similar results. My summer 2018 was a total failure also, ending with losses equating to 20 stakes. The systems chosen had great underlying features, but 80% of them failed miserably in the end. Winter 2018-19 is shaping up no better either. Currently am running at a loss of 14 stakes. Tonight has 6 pending games, and the way they are shaping up, they are all going to lose, so that will see me at 20 stakes of losses. This is with 620 bets placed in total, and almost halfway through the campaign. Everything points to a 1st half failure. I honestly am in disbelief that the real world results being seen for each chosen system are so far removed from the results in the 5 year analysis period. It seems that systems with 4 or 5 winning seasons, with at least 3 of those seasons with £1000 of profit or more, consistent hit rate over the 5 years, yield in line with hit rate, are mostly all failing. I purchased 14 tables initially and took advantage of the discount. I then purchased 2 more tables. I found something I liked, meeting the above criteria, in all of the tables, thus for this 1st half of the season I have 3 whole season systems running and 13 1st half season systems. You know what, only 5 of them are showing a small profit, but the remaining 11 are losing and losing heavily. As mentioned, the last 7 weeks have now returned a combined loss of 57 stakes; average losses of 8.2 units a week. At this rate I will equal the ignominious 11 straight losing weeks from last year. It just doesn’t make sense that a sound portfolio in terms of the underlying stats will demonstrate such results. Choosing bets at random would do better than what we are seeing here now, which ironically is the fruit of much hard work and effort, not only in making the tables themselves, but analyzing them to assemble the portfolio. I still stand by my belief that there is something fundamentally wrong with the HDAFU tables this year; as I explained in detail in my last post. RW and I obviously disagree on this. But I understand he has to defend his product and his business. It could also be that something in the market is changing i.e bookmakers making changes to how they set odds for individual leagues. It might be just a small change, but if the bookmaker prices games up differently to reflect changing market conditions, customer behavior/betting patterns, then it renders any previous historic results/patterns null and void in terms of using them as a reference point to construct a betting system. To think the bookmaker will set the odds in the same way every single year and never change things is just not feasible. And if we bet on the basis of what happened before, on what happened when the HO/AO was ‘x’, and we don’t know the bookmaker has changed their odds setting for a league in the latest season, then we are basically betting at random; on games that would not feature in previous analyses. Those are the only 2 reasons I can confidently attribute to how poorly the systems derived from the tables are performing. With 5 betting rounds (in most leagues) to go until the winter break, I may just continue with the betting and see if any losses can be recouped. At this point with 20 stakes of losses, I don’t really care if I end up losing 30 or 40 stakes. It’s like stick or twist at this point, and after such a crap period, sticking may be better than twisting. I’d rather lose the money than suffer the regret of things turning round and missing out on it like last year. I know for sure that if there is no recovery, HDAFU tables will never again be a method I use for sports betting. It’s simply too volatile, especially when dealing with a high volume of bets. Hi Jo, Simon and Rado, we are going to contact our other buyers that do not frequently post comments on the site and ask them if they don’t mind to post their experiences. However, I cannot promise if there will be any volunteering to come out in the light although there are quite a few. Another suggestion: Please email your chosen portfolios to me and I will have a look (admin[at]soccerwidow.com). However, please be aware that I am very short on time and really need to have the data prepared in a way that it doesn’t take me too much time to check to provide you with feedback. Feel free to provide me with your reasoning why you chose exactly that cluster and not another. I will reply to your email ONCE for free; therefore, please make sure that you outline your problems/questions/observations as brief and accurate as possible. for some reason I could not reply directly to your 4 December 2018 at 10:15 pm comment. In my summer 2018 just 3 out of 13 system made profit, just 1 was over 1000 units. I had just 3 leagues divided in 2 halves to increase reliability of statistical data. Didn’t work. Systems suffered heavy losses where even least expected. I was waiting for things to turn round with my winter 17/18, I was afraid what if portfolio recovers and since it didn’t happen, I was not willing to repeat this again with failing summer 2018. To me it appears if portfolio fails for prolonged period of time and 5 rounds away from winter break is exactly that, it’s not worth to keep portfolio going with real money. I learned this already twice. And if it happened to me, it will happen to you one season. I agree with you, bookies will change the way they set odds every year as punters their behavior, but working system will be resistant to this. With 3rd season failing in a row I have no reason to think HDAFU’s are reliable and resistant against variables they face. Anyway, I hope these 5 upcoming rounds will be positive for all of you. Thanks for the kind words of positivity. Sadly another disastrous betting week has befallen my Winter 2018-19 campaign. I should have listened to your advice to keep the real money in the account! 7 losing weeks in a row led me into betting round 18, and I was beginning to hope that things might turn in my favor. I mean, with a hit rate of 35% over the last 7 weeks, when the projected hit rate is 48%, you wonder how much longer that bad hit rate can last, and feel that improvement is right around the corner. The final 6 midweek games ended up splitting out for a profit, so that was the glimmer of hope. Round 17 ended with the portfolio showing a loss of 11.55 stakes. However, the glimmer of hope was short lived as yesterday and today has seen just 5 out of 22 bets win, hitting a meagre 22.73%. It was another total disaster that has seen the total losses increase to 22.21 stakes. I’m dreading tomorrow, but am already locked into those games, so not much I can do except wait and see. I expect the losses to rack up again. It really does leave one in disbelief that you can be 38 stakes in profit and then lose 8 weeks in a row to the tune of 60 stakes. It has been a collapse in a betting system of the most monumental order. I have never seen anything like it in sports betting before. At this stage I have given up any hope of recouping losses before the winter break. Taking a look at the systems I have running, there are multiple systems running with heavy losses, with the remainder now hovering around the zero sum game mark. There simply isn’t time to recoup losses and turn a profit. Sadly this venture for me is doomed for this season. My advice to anyone following the blog is that do not, absolutely do not try this type of thing. The real world outcome for many has been nothing short of disastrous and very costly in terms of outlay on the tables, time spent analyzing, not to mention hard earned money flushed down the toilet. I wish one person, just one person would report in here and tell us that they have made a success of the HDAFU tables in a real world setting. I’m still open to the fact that I fall short in the area of picking a good system and compiling a portfolio, but the lack of people talking of their own success, makes me believe otherwise. Ah well, I will conclude the weekly report tomorrow. I couldn’t reply to my post of yesterday – 8 December 2018 at 10:49 pm # – so had to reply to the original post by JO that I replied to. Well what can I say….today has been horrendous too. 1 win from 11 bets. That makes the weekly score 6 wins from 31 bets. A hit rate of 19.35%. Staggering considering the portfolio has a 48% hit rate. And this is the 8th week in a row of disastrous results. Thought I would list the weekly losses to show how things have transpired. Subtracting those losses from 38 stakes of profit leaves the week 18 conclusion as a total loss of 29 stakes. The entire venture has been decimated in 8 weeks. I find it really hard to see any way my portfolio can recover now. With 13 of the 16 systems currently operating being 1st half systems, and just 3-4 weeks of betting left before the winter break, to expect a 30 stake profit to just BREAK EVEN, when hit rates are so so low, just seems like fantasy at this stage. Then I have to hope my 2nd half systems can bail out the disastrous 1st half performance. Is it really worth it? JO….it looks like I will be conceding defeat on this today. As I suggested yesterday, please email your portfolio to me for review. Rado did it already and I’m going to have a look at it today. I cannot give you any proper advice if I do not see your chosen portfolio. As already said, they are many others who are using the HDAFU tables but it’s only the three of you that are struggling to make ends meet. Thanks again for the points you have made (yours of 05/12/18 – 12.32pm) about the odds used in the HDAFU Tables. I will try to clarify to prevent the discussion drifting off at a tangent. Firstly, the errors in Oddsportal (OP) have been the subject of a couple of articles on the SW website. I believe that some of the problems highlighted are accidental and probably caused by lags in their API’s, which are designed to interact with bookmaker websites and receive information back from them. In other cases, I believe it could be deliberate, and I don’t think it is any coincidence that the bookmakers affected tend to be on OP’s list of compulsory bookmakers – the ones that can’t be removed from those shown in your account. Of course, OP has to make a living somehow and they do this by receiving money for adverts on their site, and also by promoting affiliate programmes to encourage sign-ups to gambling-related sites in return for a commission. These errors only seem to be apparent when the ante-post market has closed and OP logs the highest odds recorded by their API’s at that time. If one bookmaker hasn’t responded to a request for information for some time then the odds shown are those at the point of the last contact. When this happens, it is usually noticeable in favourite prices – those that have drifted towards kick-off (i.e. reduced), which are then distorted by a much larger price recorded perhaps many hours before when the market was at a different stage. Football-data (FD) odds don’t tend to suffer from this problem because they are not ‘the close of market’ odds, being recorded perhaps a couple of days prior to kick-off in many cases. They also don’t employ as many (problematic) bookmakers as OP. The problem of odds ‘sticking’ at unrealistic levels near to the close of ante-post is therefore limited to OP and doesn’t apply to FD. Perhaps I’m being cynical in suggesting that the sticking odds situation suits OP as it accidentally gives the impression to the majority of their viewers that certain bookmakers are constantly offering the highest odds in the market. These accounts, therefore, scream out to be added as a serious compliment to their viewers’ bookmaker portfolios – this leads to sign-ups through the OP site and OP then receives lifetime commissions from these bookies. Then comes the problem of OP getting the odds the wrong way around – I see so many examples of the draw and away odds being swapped, which, when the away price is large, has a huge effect on the highest odds shown at the bottom of each column of odds. Quite simply, OP odds are unmanageable unless each set is checked individually. To check a single EPL season of 380 matches against OP’s time stamps takes 1-2 minutes per match if you know what you are doing and have the experience to make the job as fast as possible. At, say, 1.5 minutes per match = 9.5 hours. A full five season set is at least 50 hours’ of high concentration work. That’s just for one league. But doing this to create a fool-proof dataset created the limitation that bets could not be confirmed and placed until those final few moments prior to kick-off. This hamstrung many people, who were unable to adjust their routines to covering the kick-off times of all the matches in their chosen systems. So, in taming one animal, we created another. This is when we began looking at FD odds and running simulations, including viewing and recording odds at a multitude of points throughout the ante-post period. We soon realised that the relationship between the home and away odds does not change tremendously, even if one set rises whilst the other falls (my earlier comment seesaw analogy). The proportions of the fluctuations have to be similar in order for the bookmakers to balance their books. Therefore, taking a snapshot of odds at any moment during the ante-post period would be fine as the HO/AO (home odds divided by away odds) clusters would be large enough in their ranges to cope with the fluctuations one way or the other. This is perhaps a difficult concept to grasp, but I hope I have made this clear. In terms of FD offering ‘superior quality’ of odds to OP, what I am saying is that the FD dataset is not plagued with the errors (intentional, accidental or otherwise) that OP seems to suffer from. In answer to your question, yes, I truly believe OP odds are beset with misleading difficulties. Therefore, we now have a simpler form of data collection, which means that bets can be reliably checked and placed at any time during ante-post. This is particularly important when knowing that many favourites’ odds fall the closer to kick-off it gets (because everyone is backing the favourite), whilst the underdog odds rise to compensate. This means that favourite bets are best placed further away from kick-off, whilst underdog prices are, on the whole, larger at kick-off. This situation would not have been possible to take advantage of had we remained with the highest odds at the close of market for the simulations. In short, we’ve simplified things for the better, and the simulations we have run using FD odds, Pinnacle odds, OP audited odds, and OP unaudited odds have proved to us that the timing of the snapshot (the basis of each simulation) doesn’t matter to any significant degree with the first three datasets if using the HO/AO quotient as the rule of our systems. And because we are using the HO/AO quotient, we can now happily look at any match at any time during ante-post and decide whether or not to accept it as a bet. So, no, I don’t believe the data we use is ‘error-ridden’. When we used OP odds we cleaned them up. Now we are using FD odds, we don’t have to although they are still checked for anomalies. The important thing is to understand how the market operates and how the odds are likely to move throughout the ante-post period. For example, I have seen three distinct approaches that bookmakers seem to use when setting their opening odds. Some set the underdogs high to begin with so that they encourage money on these outcomes first – it is then perhaps a little easier to balance their book when they receive an influx of money on the favourite near to kick-off. Some use the opposite approach, and some stay constantly in the middle of the two extremes. However, whichever approach is adopted, the odds always drift close to zero or true odds, especially so on the most popular games (e.g. EPL matches). It is no coincidence that the EPL is probably the most difficult league to make consistent profits from, purely because the odds are, in most cases, pretty accurate when the start of the match is imminent. Simon, I hope this has gone some way to alleviating your doubts and concerns over the odds used for our simulations, but believe me, it is in our own personal interest to get everything as accurate as it possibly can be, as we too rely on the tables for own ventures. To make things even easier in future, we are thinking about using (where possible) odds from just a single bookmaker when compiling the simulations. It will probably be Pinnacle odds, meaning that instead of checking OP for the highest home and away odds via time stamps and ignoring odds from misleading bookies such as 1xbet and Marathonbet, the solution should be one-touch and therefore much faster and hassle-free. By all means, come back should you wish to clarify anything else and, in the meantime, thanks as ever for the time you’ve taken for the benefit of all of our readers. I think with oddsportal, the fact no one really knows how they record odds, and that we have to speculate about it and their motivations for what they display is enough to inform us that it’s not 100% reliable. We just have to accept that we will never work with exact data. But moving on from that, I did check something at the end of this week. I took one season of POLAND EKSTRAKLASA data, for 2016-17, from Football-data. They specify they obtained that data themselves from Oddpsortal – and it was collected at KICK OFF. I then compared that to the data for the same season that was in the 2016-17 HDAFU table that was collected at KICK OFF and AUDITED. Of of the 296 games listed, 147 games had at least 1 odds difference amongst the 1X2. That’s almost 50% of games where the odds are different depending on where it was obtained and/or how it was processed. Pretty significant. So if that holds true, which I expect it will, for each season and each league, then the audited vs unaudited datasets would likely tell you different things in terms of the produced inflection points. JO made a interesting discovery which he pointed out in the “2018 Summer League HDAFU Tables” article. His comment about this was dated 13 February 2018 at 9:35 pm. He noticed that the odds in his older tables were unaudited, and had been replaced in the new tables with audited odds for all the seasons. What he noticed was that this odds difference made a profound difference to the systems showing as profitable. Anyone curious about this should read his replies in the stated article. It’s interesting to note then that different data sets will produce different inflection points within the HDAFU bet types. JO evidenced this, and from my own comparison I know that the data sets do differ. So depending on where the data comes from, the time it was taken, and what processes it was put through, it will likely show strategies with varying levels of viability. So it really is crucial to know what goes into the HDAFU tables in order to know what will come out of it. In Jo’s example he uncovered a profitable strategy in Sweden for underdogs in his 2017 tables, and then in his 2018 tables saw that the same strategy was never viable at all. That is how he noticed the odds were different in both tables. I wonder what strategy was profitable in the 2018 tables if the underdog strategy was not? That then makes you wonder how there can be many different areas of profitability to exploit in the bookmaker business model? If one data set says, “Bet Underdogs”, but the other says ” Bet Draws” then it seems strange that the bookmaker has all these areas that can be exploited. Only one set of data can be correct at the end of the day. So it leaves me going back to the point of you only get out of the tables what you put into them. RW you mentioned that the tables were working as intended, but to explain the bad results for customers over the last 3 Winter, Summer, Winter seasons, you believed something within the sport of football itself was at fault. What do you mean by this? To me it seems like you are suggesting that there is something out of our control that is rendering the data and the statistical analysis useless. If that’s the case, is there any point in continuing with the portfolio style of venture based on HDAFU tables, if there is some uncontrollable factor at play that is randomizing things beyond all expectation? England – 3 out of the last 18 draws won. The remaining 6 systems are doing relatively okay, but cannot compensate for the enormous losses the above 8 systems are racking up RAPIDLY! This is almost impossible. Even if the HDAFU tables don’t really work, most of the hit percentages don’t correspond to the odds the bookies are placing on them and are WAY below the normal distribution. For example, in the Netherlands, the average odds for the draws I bet on are about 4. That means that about every fourth match should win, not every eleventh. In England – the same – every third match should be a draw, not every sixth. In Denmark – every third underdog should normally win, but they have won only ONE of the last 13 times! That means that the bookies are losing hugely on people that are placing bets on the favourites there, which doesn’t make sense. I think Soccerwidow’s tables are not to blame here. It’s simply a streak of bad luck that is beyond imagination. you probably don’t know one of my very first articles on Soccerwidow; I wrote it a very long time ago: Heart Beats Brain – Is Accurate Forecasting of Specific Results in Football Matches Possible? I wrote it in February 2011, the second month after I started with Soccerwidow, and there, I analyse the English Premier League results of 5.2.2011 that were simply amazing. What was observed that weekend happens statistically only once every 760 rounds of matches or once every 20 years! However, that article seven years ago was about goals, your observation now is about 1×2 results but, just from reading your comment and without analysing anything in detail you are probably right that there is currently a streak of bad luck that is beyond imagination. Successful betting is all about distributions and these distributions occur over very long periods such as a whole season what is certainly not always easy on the nerves. thanks for your very full response. Of course, I can understand your points. However, I read a lot of comments in your articles that people are struggeling to make profit – at least I am interpreting them that way. In my point of view this to some some extend because people might not able to use it in the way its made to use but more because the market prices are almost always (for events with high liquidity) perfect, when we deduct the vig and calculate real implied possibilities. I further would argue, its kind of easy to find a “sytem” or “pattern” or “quotient” which worked quite well for the last seasons/years and produced an excess return. Just simply we have data on all that and can model something around to produce this excess return. Anyway, I think there is no peristents in those things because prices in the market are as mentioned almost always correct. Back to the point of my first comment. If what i said would be nonsense and you are really trusting your tables than you would place bets accordingly. If you then would post results – wouldnt this bolster the confidence of your costumers enormously and even help you to get new costumers. Please, dont misunderstand me, I dont wanna do down your work, I am just really interested in the topic and that was something what came into my mind and I wanted to discuss. Yes, you are right, there is a good number of comments with people struggling to make a profit. But this is what the comments are mainly used for… They are used by readers for customer support, not for reporting success! As long as people are struggling they continue posting and when they ‘hit the jackpot’, they stop. We only know that they are successful because they purchase the following year a new set of tables and also occasionally email to us directly with some queries. Peter, I hope my reply makes sense to you… Summarising, when people struggle and try to understand (that means that they are in the middle of a learning process) they are busy in writing comments and asking questions but once they have finished learning and everything starts going according to plan, then there isn’t any need for them to communicate on our articles any more. Soccerwidow is an educational site! I understand what Peter is asking; he is making a distinction between the theory behind how and why the HDAFU tables can be used to compile a portfolio, and the reality of how that portfolio performs in the real world. What he seems to be saying (I’m not putting words in his mouth; it’s how I interpret it) is that it is all well and good seeing an example portfolio, that could have been compiled to “look” successful, but it is a different story to actually see that it did indeed operate in the real world with real money wagers. Peter talks about evidence of this, which can only come by way of bet tickets, which RW mentioned. I don’t think anyone should be requesting to see the bet tickets of the bets that were said to have been placed in the real world as part of the published portfolio. That is not really any of their business where the bets were placed and for how much. It would be nice, however, to get absolute clarification on one thing though; are the campaigns that were published here compiled purely as examples, illustrative and for marketing material if you will, or were they actually carried out in the real world with money placed on each bet? A ‘Yes’ or ‘No’ to that would answer Peter’s question. He can correct me if I’m wrong but I believe he is implying that the campaigns published here have been done so retrospectively such that the end result will show favorable results whilst being believable. I don’t know if that’s the case. He also said that there were comments made in the comments section saying that people were struggling for results. I have only seen those type of comments last year, not this year. Personally I posted comments last year in my 1st attempt at this type of betting strategy. I posted in the early stages to give feedback of positive results. I also posted regularly during a very tough stretch of 11 straight losing weeks (from September 2017 to November 2017) and big losses. I then took a break to paper test, and then returned to update that the results had improved and the 1st half of the season had made a profit. I also updated at seasons end in may 2018 to show that the whole campaign made 58 points of profit. Obviously I did not benefit from any of that profit as the huge swing and high volatility put me off. Many people at that time in 2017 were struggling for results. I don’t know how their campaigns ended up. I then tried a summer league campaign starting in March 2018 this year. Despite following all the advice, and spending considerable time trying to get the portfolio right, the whole thing was a spectacular failure. I had to stop betting on it because the warning signs were there; but with the rest paper tested – the overall result was a 20 points loss. This year, for me personally, despite trying to reduce the volatility, again I’m seeing huge swings in profit/loss. After 10 weeks I had accumulated 38 points of profit, now as we speak, 16 weeks into the campaign, the profit is a mere 7 points. So it has taken 6 weeks to have my profit almost wiped out. The yield is therefore minuscule, and although I’m not running at a loss yet, it could be argued that the time invested has been wasted. Where is it all going wrong? It seems to be a hit rate issue again. The hit rate was running along nicely, similar to the forecasted value, and then has plummeted. The forecasted rate is 48%. For 10 weeks the posted hit rate was 44%. For the last 10 weeks it has dropped to 36% on average. What can one do when the drop is so large and persists for so long. I know one other person who is running a campaign – we speak regularly – and his portfolio experienced a huge downswing at the same time as mine. We have very different systems and overall campaigns. So, with a blend of whole season systems and 1st/2nd half season systems, time is running short again for a recovery. 1st half season systems will conclude in 7 rounds time (including this weekend), and that’s not much time for a big turnaround. The point is….and this ties into what I believe Peter is asking, why do many of us, who no doubt choose the obvious profitable systems, struggle along, while the example portfolios published here run along almost perfectly. The latest one for 2017 made £9k in 500 bets. I have placed 528 bets now in 2018 and have 7 points of profit or £700 to show for it. Thats an absolutely huge difference in performance. One does wonder how the examples bring in huge profits, and the ones we construct struggle along and perform woefully. I can accept that I may be doing something wrong in portfolio compilation that is leading to hugely subpar results. But considering the time I invested in reading the articles and the care I employed in following the instructions, I am confident that the systems I have chosen are good and the portfolio sound. If anyone here has portfolios that are performing well as of now, please do share the results. Anyway, I’m not complaining, it’s my own choice to engage in the portfolio style of betting. Sadly though, for most of us, because there is a lack of real world reports showing comparable results to the published campaigns, it seems that we just will not have success with this type of venture. It’s hugely demoralising to see how well the example campaigns perform, only to see our own do very poorly in comparison. As you know I’m a regular customer over the last 2-3 years – and wanted to share my experience and give some feedback. regarding the huge downswing during the 2017-18 campaign that you experienced and also a few other readers, what I can say is that our portfolio experienced the effects of it too. This was despite probably playing (or monitoring) very different systems and campaigns from one another. This downswing started during the week commencing 9/12/2017 and continued until mid-March 2018; just over 3-months! It was a very, very long, dark period with non-performing portfolios producing deficits – it was also a very difficult time on the nerves. Back then, the comments on the HDAFU articles became very busy and were mainly negative, and there were many people saying that they were struggling for results. Right now is the first period of the 2018-19 season where the negative comments have returned. Before then, everything went relative to expectations. As I said in my previous reply to Peter, people are very busy commenting when they struggle and tend to keep it to themselves when things go smoothly. Therefore, Simon, many thanks to you for sharing your experience! Why this downswing happened last season, why exactly at that time, why for such a long time… We honestly don’t have an answer to those questions, at least nothing fundamental. The only explanation that we can give is the unreliability of distributions, especially when playing low probabilities. Here is an article on The Science of Calculating Winning and Losing Streaks for those of you who don’t know it. Our example portfolio had 505 expected bets for the whole season with an overall expected hit rate of 48.17%. A whole season consists of 47 betting rounds. This means that a portfolio with as low a hit rate as 48.17% is expected to experience one losing streak of 6 consecutive weeks – we were, therefore, lucky in only experiencing four consecutive losing weeks. Regarding the question, if we bet ourselves… The answer is: sometimes yes, sometimes no. It’s simply a question of not having enough time to place bets and handling multiple bookmaker accounts each week without a break from the beginning to the end of a full season; we are already spreading ourselves too thin. I have written the article about Starting or Pausing Your 1X2 Portfolio in the Middle of a Season to show that you don’t need to place bets every single week during the season. I compile a portfolio at the beginning of a season, hand it over to Rob (Right Winger) and he plays it when he’s got time. What I can certainly confirm is that the bottom line of Rob’s betting endeavour is positive each year. I’m writing “Rob’s” because I myself do not bet! Thanks for the response. Again, just wanted to reiterate that my posts are not motivated by the urge to complain about bad results, but to find out why things are going wrong with my portfolio, and also to manage expectations of the results to be had, and if possible, make the venture a success. So, my position with the current campaign is 38 stakes of profit were accrued in the first 10 weeks. My thought at that stage was the portfolio had overachieved in that span and would likely see some decline. The following 6 weeks have seen the profit totally lost and the portfolio fall into a loss of 8 stakes. The most recent week was horrendous, losing 19 stakes. The hit rate was 25%. As mentioned before the forecasted average hit rate is 48%. 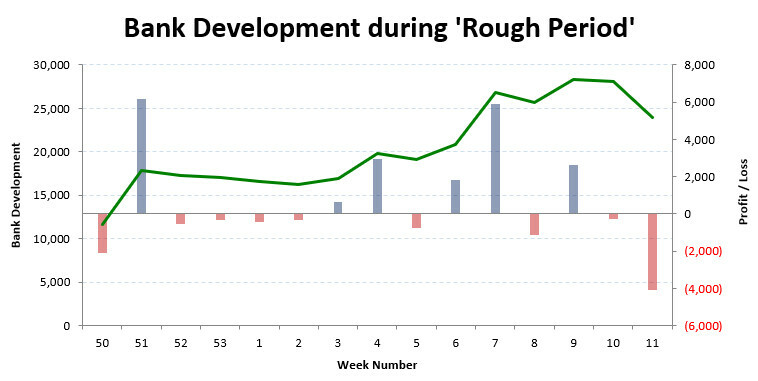 The last 6 weeks have seen a hit rate of 32%, which is a huge difference. I can accept that all systems can lose at the same time for a period, and if that happens, then there’s nothing one can do about it. I can accept that we can expect a 6 consecutive week losing streak. It’s the severity of the weekly losses that concerns me more than anything. A 46 stake swing in 6 weeks is catastrophic. And with 6 weeks of the 1st systems left to go, its natural to fear that the venture is going to fail. And if that’s the case, I wonder why my portfolio is looking like a disaster, when the example one performs perfectly. You mentioned in your example portfolio you had a rough time. However, in this rough time, where there were consecutive losing weeks, they were small in magnitude and followed a big winning week. In fact, in this dark time as you described it, the overall profit increased. So, in reality, your portfolio was not damaged. For some of us, we have decent profits wiped out and turned in to sizable losses. Now I don’t believe this is once in a lifetime bad luck. The reason I say this is because last year, the same thing happened, albeit a little earlier. A 24 stakes profit was erased and turned into a 34 stakes loss by the start of November. To be consistent and balanced by the end of the 1st half of the season the profit was back to 24 stakes. In this case now, the collapse has happened later and so there is much less time for a recovery. The risk of my portfolio is lower this year than last year, so one might expect volatility to be less. This experience, in addition to the experience of others, tells me that the portfolios we have made are subject to very high volatility, and tend to experience large swings in profit and loss irrespective of the risk balance. If this season was once in a lifetime bad luck, why did it happen to many of us last season too. Now, this leads me to believe that we are possibly making mistakes with the assembly of our own portfolios. Are we selecting bad systems? Are we balancing portfolios wrong? I repeat that I read your articles many times to absorb all the points. I spent considerable time making sure the systems I picked were sound. I made sure I balanced my portfolio in accordance with your guidelines. But I still see this volatility. And I wonder why the example portfolio published here amassed a fortune, and our own are struggling hugely. So, this leads me to examine the example portfolio of 2017-18, which contained 500 bets and accrued £9000 with £100 flat stakes. In the article it stated that the 10 systems on show were selected by alphabetical order. It also stated there were more systems in the actual portfolio that were not shown in the example so as to keep things brief. In the example we see that ALL 10 systems won. The question springs to my mind then is what happened with the other systems that were not shown? Did they also win? Did they lose? And if so, to what degree? I don’t expect that you show the results of these “not included in the article” systems. But having 10 systems win out of 10, it would be reasonable for me to say that the example portfolio was extremely lucky, perhaps its systems cherry picked for illustration, and not reflective of what the average HDAFU user could expect. With 10 out of 10, it is no wonder the results seem out of this world. Going back to the 2016-17 campaign that was published here, the number of bets was around 1200, and the profit £20k. That portfolio had some systems winning and some losing. That one seems realistic. Not knowing what happened with the “other” systems in the 2017-18 portfolio makes it impossible for us to know if 2017-18 was really as good as the published version. I think in some part, it’s the expectations of what can be achieved that leads to disappointment when we see the reality. I think showing a “perfect” version of what can be achieved is providing expectations of something that is not achievable for most of us in the reality. We as customers purchase a product, which with proper use, could reasonably expect average results. Something is going wrong somewhere….and other than chalking it up to bad luck, I just don’t know where. My goal is to make this a success. Going forward, my portfolio may continue on the downward slide. It may recover in time for the winter break. Either way I will come back to give an update on how it has fared. i guess the results are rather theoretically. You didnt play the bets shown above by yourself didnt you? If you claim yes, it would be nice to get some evidence as well. All the results can be checked using historical odds sites such as Oddsportal – you will find we obtained highest or close to highest odds only sometimes – otherwise, the prices in our report were the ones we bought when the bets were placed. The report works on 100 unit stakes to provide realism to the campaign – we have stated that it is a simulation – in other words, the simulation is set at a level that is achievable for many punters and doesn’t require a huge starting bank. What we have said in the report is enough I think to convey the message that this is absolutely possible to replicate. I don’t see much point blowing our own trumpet by revealing bets that carried larger starting stakes or ratcheted increments – just simply multiply the results by whatever is sustainable in terms of your own betting bank size to see the real potential of these systems. I don’t wish to seem elusive, but the amount of time and effort it took to produce the campaign report is definitely enough. I have no desire to go trawling through multiple bookmaker-accounts to find the histories of the bets and then spend more time cropping screenshots and marking them to hide account information, etc., just to make them presentable. Doing this wouldn’t add much more value to what we have already written and, to be honest, I just don’t have the time. We’ve shown how the systems were selected, we’ve demonstrated them in action, and have produced a hugely detailed financial summary, all of which can be checked in terms of match results and the odds obtained. Telling you how to do it yourself is the mantra of Soccerwidow and I feel this is more important than divulging our own personal financial details. Sorry if this is disappointing news, but we have to draw the line somewhere. Thanks for taking the trouble to write and best of luck with your own ventures. I guess I am in a way, i’m also referring to the full report where the mentioned min and max odds are displayed in the portfolio sheet. I answered your query in the other article but if I misunderstood what you were referring to then please find the respective post and ask there. Otherwise you leave me guessing what you mean. just out of curiosity can you explain how did you get the expected min and max odds in portfolio tab lets say for the England EPL which range from 3.36 to 3.54. If i input the same system in the free England 2017-18 HDAFU table the corresp.odds are from 3.46 to 3.50, even if i manually scroll trough the clusters the odds range from 3.21 to 3.56 so i’m not sure where is the difference. You are referring to the article Finding a System Using the HO/AO Quotient, to the screenshot Image 2: System Picker example taken from the free England 2012-16 EPL table? I’m going to copy your question in the corresponding article to your question and answer it there. I’m surprised you only had 10 systems running for this winter season when you had 22 seasons in the previous winter. Can you explain why so few? For the sake of brevity, we have decided to show this year only the first 10 European leagues in alphabetical order: Austria, Belgium, Denmark, England, France, Germany, Greece, Italy, Netherlands and Poland. The overall results you see would have been very similar whichever 10 leagues we chose to illustrate with. We could have picked them by number of letters in their names or in any other random manner. If we would have displayed all 22 leagues then the profit shown would have been a multiple of the k35 shown in the article when applying a strict ratcheting. However, the main point we actually wanted to make was that by choosing 10 leagues only it is possible to get a decent profit. You have to be realistic. The time it takes to analyse a system, then to monitor it and also to place the bets, is huge. The majority of our readers have full-time jobs, they simply cannot commit themselves to full-time betting. I bought 2017-2018 campaign spreadsheet and I discovered that it doesn’t size itself to the screen resolution when opened on screen larger than 15″. I struggle to find a way to size it properly on 24″ screen. Can you help? yes, this was weird. I’ve just had the same problem on my computer. I therefore replaced the file in the shop and sent you a new download link. Please can you try if it now works.